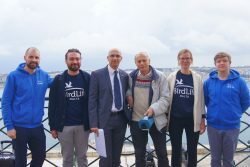 BirdLife Malta is currently working on a project Together Against Air Pollution from Ships that will be delivering an awareness campaign on air pollution generated by cruise ships in the Mediterranean. In Malta, concentrations of ultrafine particles in the ambient air when ships are transiting through the Grand Harbour have shown to be 80 times higher than clean air levels expected of areas not exposed to any pollution sources, highlighting the need for solutions to air pollution from ships to to help better protect biodiversity. 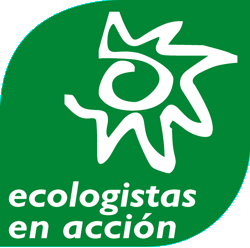 Launched in December 2016, the project works with international partners including NABU (BirdLife Germany), BirdLife Greece, and other NGOs in Italy, Spain and France with the long-term goal of establishing a network among Mediterranean countries supporting the establishment of a Emission Control Area (ECA) in the Mediterranean Sea. Despite the fact that clean air is a basic requirement for human health and well-functioning ecosystems, air quality is globally in a constant decline particularly in urban areas. Cruise ships, berthing in harbours often located in close proximity to dense urban areas contribute massively to air pollution that threatens our climate, our environment and our health. In 2012, the World Health Organization identified that 95% of Europeans living in urban environments are exposed to levels of air pollution considered dangerous to human health and about 420,000 premature deaths are known as a result in the European Union. Running engines of ships contribute considerably to global and local emissions of sulphur oxides (SOx), nitrogen oxides (NOₓ) and particulate matter (PM). The latter includes soot emissions (black carbon) which are in particular harmful to health and climate. NOₓ emissions diminish the function of the lungs and increase the risk of cardiovascular disease. NOₓ is also a powerful greenhouse gas causing climate warming due to its contribution in the formation of ozone (O₃). High concentrations of O₃ in cities are responsible for the death of elderly people and people with poor health conditions. Emissions of sulphur oxides such as sulphur dioxide (SO₂) are harmful for our environment, not least because it causes acid rain which leads to the eutrophication of soils and coastal areas and it damages buildings and structures, particularly those made of limestone. Air pollutant emissions are furthermore responsible for a significant loss of productivity in agriculture and have a negative impact on biodiversity. Cruise shipping movements in Malta have increased by almost 16% over the past six years with 280 cruise ships in 2010 and 324 in 2015 berthing at Valletta Cruise Port. 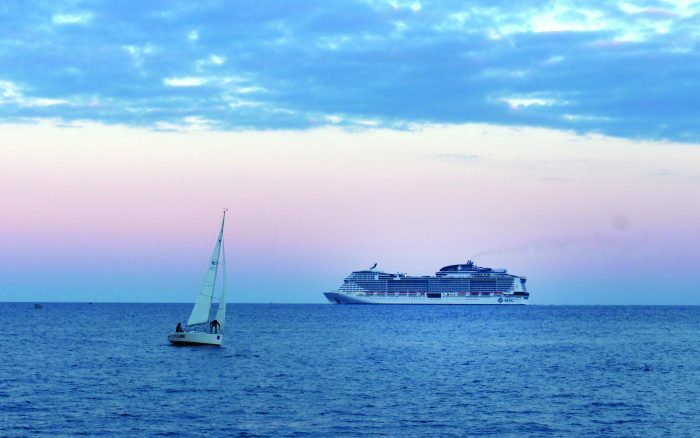 In 2014, cruise ship passengers stood at 471,554 for the year, a rise of 9.3% in comparison to 2013. Because of the small size of Malta, it can be assumed that a major part of the island is affected by the above-mentioned impacts. This adds on to Malta’s significant air pollution caused by traffic, energy generation and industry, identified as major concerns to the environment and health under the Strategic Plan for Environment and Development (SPED). Malta’s Greenhouse Gas emissions increased by 54% between 1990 and 2012, the transport sector being the principal contributor with 91.1% in 2012 (SPED, 2015). 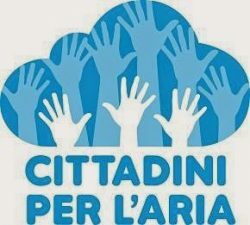 BirdLife Malta will implement the project “Together Against Air Pollution from Ships” together with various Mediterranean environmental Non-Governmental Organisations including Cittadini per l’Aria (Italy), France Nature Environnement (France), Ecologistas en Acción (Spain), and our BirdLife partners Ornithologiki (Greece) and NABU (Germany). We will work towards national awareness raising and knowledge development on air pollution from ships through activities and information sharing among relevant stakeholders as well as general public. As a long-term goal, we will work together with our partners towards the establishment of a network among Mediterranean countries supporting the establishment of a Emission Control Area (ECA) in the Mediterranean Sea. Emission Control Areas (ECA) are declared areas under the International Convention for the Prevention of Pollution from Ships (MARPOL) ANNEX VI of the International Maritime Organization (IMO), which regulates air pollution from ocean-going vessels and ships in international waters. Ships are obliged to limit their maximum Sulphur content of fuel oils to 0.1% in comparison to outside ECA where a limit to 3.5% is established. The regulations apply to SO₂ emissions generated from ships including combustion equipment and devices onboard. To tackle these problems, the project approach is divided into three parts. With the aim to increase the knowledge of the problem of air pollution from (cruise) ships among the general public and identified national stakeholders, we will work towards sharing and publishing information on the topic regularly. Communication activities include distributing project background material, regular updates on the project’s website will make it possible for interested parties to follow all developments. Improving the quality of data on the causes and consequences of air pollution from cruise liners provides the groundwork to respond appropriately to the problem. Through air quality monitoring, emission control and research on national health studies, we will work together with relevant stakeholders towards providing the opportunity for suggestions on the development of environmental policies in this field. Existing national baseline data will be researched and collected to be able to measure change throughout the project circle(s). Together, we will identify the most suitable solutions for Malta and the Mediterranean Sea to tackle the problems arising from ship emissions. These include for instance a change in political measures (establishment of emission control areas), technical measures (obligation for ships to install diesel particulate filter, selective catalytic reduction systems, seawater scrubbing and the use of liquefied natural gas), infrastructural measures (onshore power supplies from renewable energies), and voluntary measures for ports (ecological port fees depending on environmental performance of ships, incentive programs to motivate ship owners to be more environmental-friendly). On the national level, the project activities have to be aligned with the objective to work together with relevant stakeholders from the maritime industry and authorities and discuss the necessary steps for the implementation of a ECA in the Mediterranean Sea. On the international level, a network will be established that is able to work on shipping related to air pollution in the partnering Mediterranean countries. Regular exchange of information and knowledge sharing will take place through this network and we will take part at periodical conferences with other European members of the “Clean Cruise Ship Action Network”. This project involves six European partners which are all Mediterranean eNGOs, two of them BirdLife partners in Germany and Greece. Click on their logos to learn more about them. French study published in January 2019 showing that an ECA in the Mediterranean could save 6,000 lives each year and would bring up to €14 billion in reduced health costs. NGOs background paper on the Mediterranean Emission Control Area. The results of the second exercise in air pollution measurement carried out in Valletta (23 & 24 June 2018) and footage of the exercise being carried out. Presentations and input provided by stakeholders such as national governments, EU bodies, industry stakeholders, leading scientists, ports and NGOs during the international shipping conference in Rome, March 2017. (Balearia, CE Delft, Danish Ecological Council, Dr Axel Friedrich, French Ministry for the Environment, NABU, Paul Scherrer Institute). 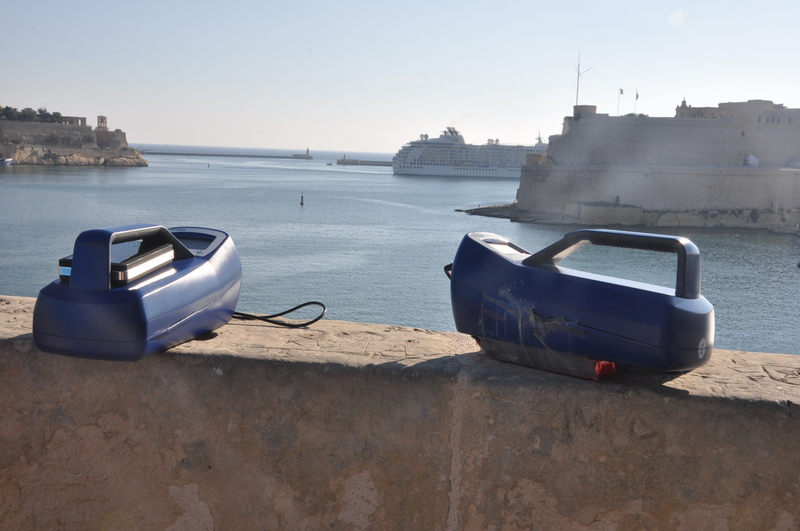 The results of the first exercise in air pollution measurement carried out in Valletta (08 December 2016) and footage of the exercise being carried out. 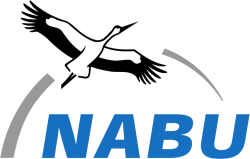 NABU (2015): Clean Air in Ports Manual. Centre for Energy, Environment and Health (2011): Assessment of Health-Cost Externalities of Air Pollution at the National Level using the EVA Model System. More information about the project from NABU. A new study to assess the benefits, costs and feasibility of implementing an emission control area (ECA) to limit sulphur oxides (SOx) from ships in the Mediterranean Sea will consider, among other things, the potential health benefits for people living around the Mediterranean as well as cost implications for ship owners. An international consortium led by Energy & Environmental Research Associates (EERA) signed (in June) the contract with REMPEC to carry out the study, to be finalized by spring 2019. Funding for the study, which REMPEC will present to IMO’s Marine Environment Protection committee (MEPC), comes from the Mediterranean Trust Fund, the IMO’s Integrated Technical Cooperation Programme and a voluntary contribution from the Government of Italy. Click here for more information. 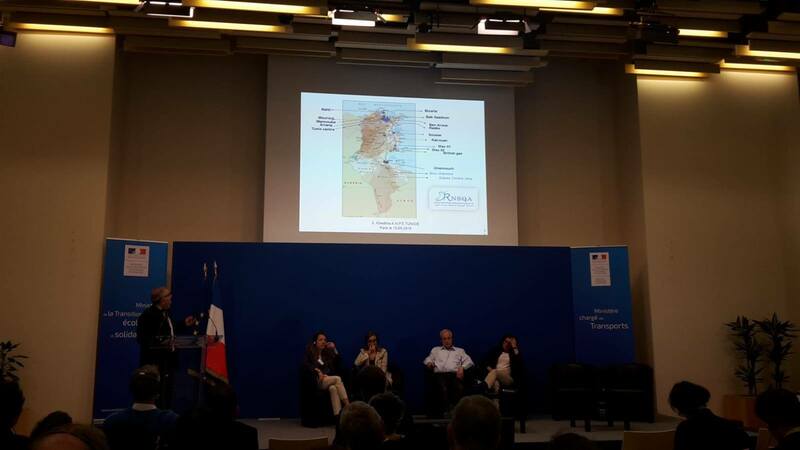 With the focus on reducing air pollution from ships in the Mediterranean Sea, BirdLife Malta participated in the second “International Mediterranean Shipping Conference” held in Paris, France on 15th May 2018. Shipping is a contributor to air pollution that has impacts on human health, the environment and the climate. For coastal areas and port cities ships are a major source of air pollution. However, in comparison to road transport, few actions have been put into place in order to effectively reduce shipping pollutants emissions. The International Maritime Organization (IMO) adopted in October 2016 a 0.5% sulphur threshold for shipping fuel, but it will only enter into force in 2020. Nevertheless, ships will still be a major source of toxic air pollution. Hence, areas with high shipping traffic as the Mediterranean Sea are particularly affected by these harmful shipping emissions such as particulate matter, black carbon, nitrogen oxides and sulphur oxides. Thanks to the creation of Sulphur Emission Control Areas (SECA) in the North and the Baltic Sea, air quality got significantly better in this area. Therefore, effective means to reduce air pollution from ships in the Mediterranean Sea such as an ECA should be established likewise. In Paris, stakeholders from the shipping industry, ports and cities not only reflected on the shipping emissions’ impacts on the Mediterranean region but also identified the technical and legislative means to effectively reduce air pollution from shipping as well as corresponding challenges. They also addressed ways to ensure proper compliance and enforcement of the existing and the future regulatory framework. European member states attended a meeting of the International Maritime Organization (IMO) in April 2018 to adopt an initial Greenhouse Gas (GHG) strategy for the shipping sector. Shipping emits 3% of global CO2 – and emissions are increasing year by year – yet it remains one of the few sectors of the global economy without sector-specific emissions reduction targets. Malta – being one of Europe’s biggest shipping registries and thereby having a stronger voice when it comes to decisions over changes in the international shipping sector – has been identified to lack clear ambition in the climate negotiations, putting economic interests before environmental, health and not least climate interests serving the common good of the public (Transport & Environment Ranking 2018). EU member states have decided to support a 70-100% reduction in maritime greenhouse gas emissions worldwide by 2050, compared to 2008 levels. A new study on air pollution from shipping reveals the direct link on health impacts and shipping emissions and assesses regional health benefits as well as positive effects on global climate in the near future. Currently, ship-related health impacts include about 400,000 premature deaths from lung cancer and cardiovascular disease and about 14 million childhood asthma cases annually worldwide. After 2020, all vessels will be obliged to switch to lower-sulphur marine fuels. The UN’s International Maritime Organisation (IMO) is introducing tougher standards on marine fuel quality of 0.5% sulphur maximum, compared to 3.5% currently. This will lead to a decrease in health-related issues caused by international shipping. However, with regard to the study’s findings “despite these reductions, low-sulphur marine fuels will still account for about 250,000 deaths and about 6.4 million childhood asthma cases annually”. By analysing geospatial shipping data (analysis of statistical and geographical data) of over 64,000 IMO-registered vessels on a global scale, local intensities of these changes in health and climate have been found to be directly related to major trade routes and continental coastlines. For a small island state like Malta impacts can be more devastating, given its location in close distance to major shipping routes (e.g. Suez Channel – Strait of Gibraltar) and a long coastline with residential areas in close distance exposed to massive shipping traffic (e.g. Port of Valletta and residential areas along the Peninsula). Sofiev, Mikhail et al. 2018. “Cleaner Fuels For Ships Provide Public Health Benefits With Climate Tradeoffs.” Nature Communications 9.1 (2018). 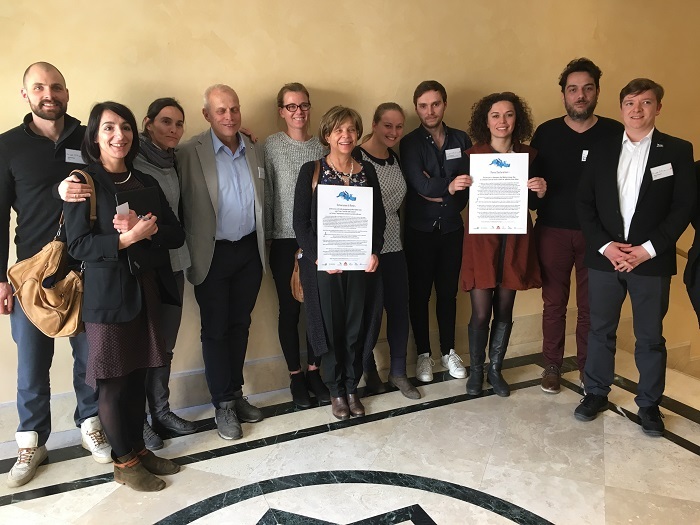 On Tuesday 28th March 2017 the alliance of European environmental organisations participating in the “Together Against Air Pollution from Ships” project adopted the “Rome Declaration” to designate the Mediterranean Sea as an Emission Control Area (ECA) to limit air pollution from ships. The declaration followed a one-day international Mediterranean Shipping Conference held in Rome. 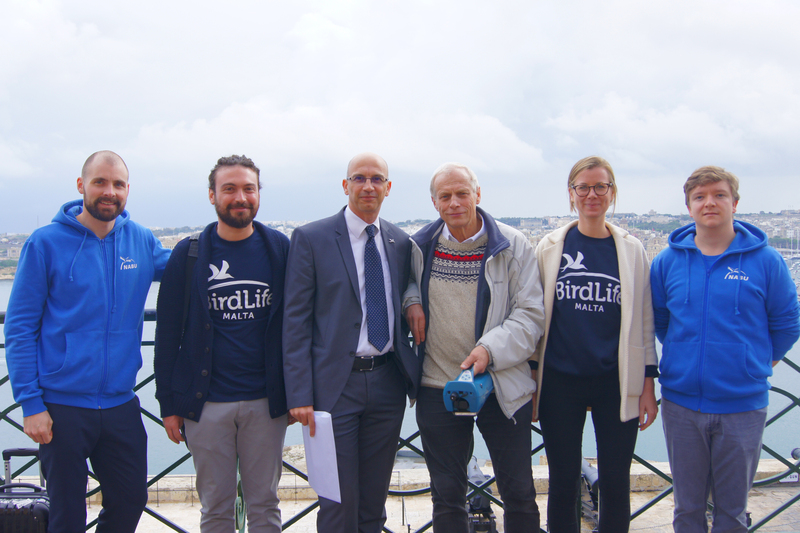 BirdLife Malta was present as one of the signatories. Click here to read the press release issued on the adoption of the declaration on Wednesday 29th March 2017. 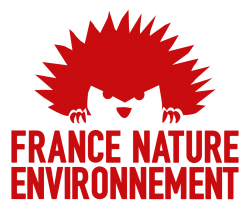 Click here to read NABU‘s latest press release issued on 24th January 2017 on the high levels of ultra-fine particles found on deck of a cruise ship following an exercise carried out by French journalists and reported on French TV. The measurements confirmed that cruise ships’ exhaust gases not only severely damage the environment but also harm human health. Undercover air tests taken on the passenger deck of a European cruise ship unveiled high loads of health damaging ultra-fine particles in the ambient air. A journalist documented concentrations up to 200 fold above natural background levels. The measurements were carried out by a French TV team working for the renowned TV show “Thalassa” which was broadcasted on January 20th on France 3. 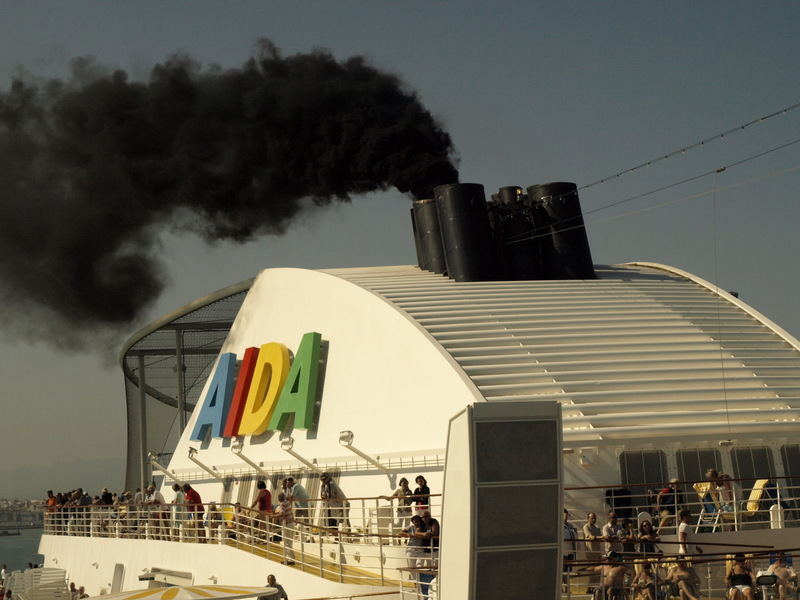 This documentary initiated a big discussion on air pollution from cruise ships in France.